It had to happen sooner or later: the supes get mad enough to go after the Boys. One of the world's most powerful superteams decides to hit our heroes, all guns blazing, and the Female is the first to fall into their lethal trap. 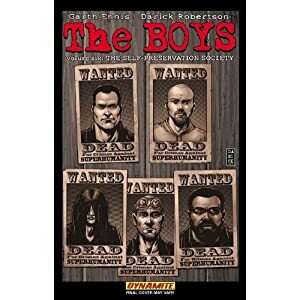 The sixth Dynamite collection of Garth Ennis and Darick Robertson's The Boys is here, complete with a cover gallery. Wow! We get an altercation with Payback, plus some of their origin story. A shakeup with VA and the Seven. And origin stories for MM, Frenchie, and the Female. What a volume! I've really come to care about The Boys and what happens to them. I want to see MM avenged, Frenchie loved, and The Female become human. I want Wee Hughie to be happy, whether with Starlight or not. And I want to see Butcher made whole again. We don't know his story yet, but I'm sure it's a good one. I'll just have to wait for the next installment.